Infection control is a major issue for the early childhood classroom. Because viruses and bacteria are not visible, preschool children have a tough time understanding the concept that they must keep their hands clean, prevent sneezing in the air, and not to share cups when drinking. 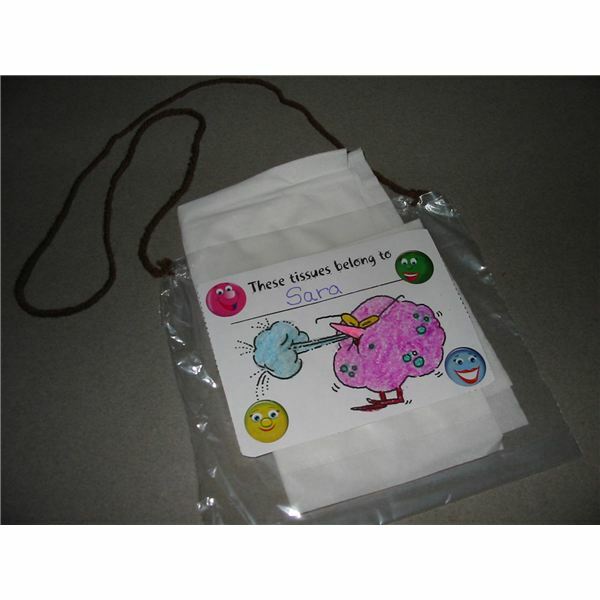 PreK germ activities and a book about germs help to round out this health lesson. To help with this theme, a book Germs Are Not for Sharing by Elizabeth Verdick [Free Spirit Publishing] is a good start to introduce children about how germs can make them ill. According to the publisher, "this book is a short course for kids on what germs are, what they do, and why it's important to cover them up, block them from spreading, and wash them down the drain." The book is written in simple language that children understand and illustrations of real-life circumstances that preschoolers will relate to. A little sneeze is a powerful way to send thousands of bacteria and germs flying into the air. If a child happens to be in the vicinity of that sneeze, he can pick up the germs just by breathing. So teach the children to cover their sneezes; the best way is to sneeze into your elbow crease. Little children do not always think that fast so sneezing into their hands could create a problem. Anything they touch, toys, other children's hands, doorknobs, and such can be covered with germs. Hand washing is imperative after a sneeze. To demonstrate how a sneeze produces droplets of germs into the air, fill a spray bottle with water. Spray the water into the air and into a facial tissue. Explain that when a sick person carries germs it is like the water spraying from the bottle as it gets on everything. Tissues do help the distance of the flying bacteria so by making "personal packs" of tissue for an art project can remind children to grab a tissue when a sneeze or runny nose comes about. Give each child a zippered plastic sandwich bag and a supply of fresh tissues to put inside. On paper, invite the children to draw a person (or themselves) sneezing. Let them color the drawing and even attach pretty stickers to decorate their sneeze packet. On the top write, These Tissues Belong To ________. Punch two holes at the top and thread a strand of yarn to make a necklace. Instruct the children to carry their packet with them on days of a sneezy, drippy nose or to keep the tissues in their cubbies for future use. Teach the children this fun song that relays a concept. The tune is "Oat, Peas, Beans, and Barley Grow." Do you know what I always do? And into my tissue my kerchoo goes. KERCHOO! There are many times each day to wash hands in the preschool class to get rid of germs. It's a good idea to wash hands when first arriving at school to rid any germs that may be coming from home; there could be a sick sibling, germs from a pet, and so on. Repeat hand washing during the day after toileting, sneezing, blowing noses, outdoor play, after playing with toys and materials like play dough, and always before meals. Young children use their senses when learning skills. They are very visual, so place a fun and colorful poster above the sink to remind children to wash their hands. A quick rinse will not kill germs, so children need to lather and scrub well when washing their hands. After placing the soap, invite the children to sing songs while lathering. Such songs as Twinkle, Twinkle Little Star, Happy Birthday (sung twice) and the ABC alphabet song are easy for preschoolers to remember. The sense of smell is appealing to children. Liquid soaps come in many fragrances and child-friendly containers, so changing the scent from time to time may increase enthusiasm about washing. Train children to become vigilant germ fighters in your class, as you practice these PreK germ activities. Remember, healthy kids make happy kids! Personal experience in the classroom.